The first thing you need to do is gather your supplies. You will need pruners, a 10 to 12" flowerpot, potting soil, root starter, and a 1-gallon clear jar. Step #1 - Look for a rose stem that has at least two sets of leaves. Step #2 - Remove the petals from the rose by gently cupping the rose blossom in your palm and pull the blossom away from the stem. If you want to enjoy the blossom, place it in a bowl of fresh water so it will float. Step #3 - Remove all sets of leaves except for the tops set of leaves (one or two). Step #4 - Take the potting soil and fill your flowerpot with the soil. Step #5 - Measure the rose stem against the flowerpot; half of the stem will need to be buried in the potting soil. Trim the stem if necessary for it to measure correctly. Step #6 - Poke a hole in the potting soil with the stem. Now bury half of the stem in the soil. Step #7 - Dip the end of the rose stem into the root starter. Step #8 - Pat the soil around the rose stem. Pour water over the potting soil. Step #9 - Place the 1-gallon jar over the stem, leaving headroom for the rose stem. Step #10 - Settle the jar firmly into the soil, being careful not to touch the leaves. Now you have created a terrarium for your cutting to take hold and hopefully grow. Place the flowerpot in a shaded place facing north. Ideal locations may include behind a bush or in the shade of a garage or shed. 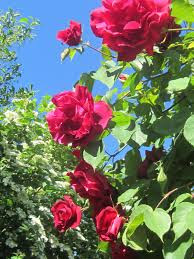 It is very important that the cutting NOT be in the sun or the new rose bush will scorch. Leave your cutting alone for several months. You will NOT need to water because of the terrarium. If you are successful, you will see new leaves forming on your stem. Once the rose has several new leaf sets, and the ground is warm you can transplant your new rose bush into your flower garden.